Very early settlers of North America had at least some ability to make water-crossings, since there is evidence of early human activity on the Channel Islands off California (Santa Rosa, for example). 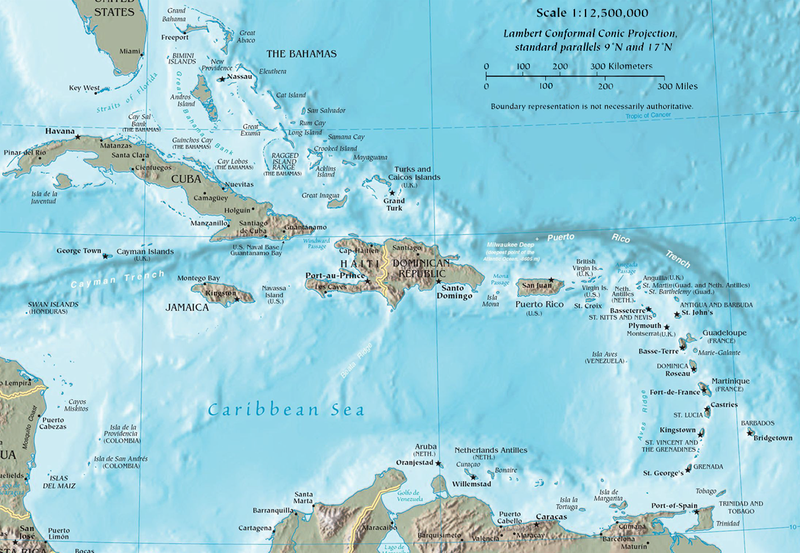 But by the time they crossed the continent and reached the Gulf Coast, those traditions had decayed and had to be re-invented: the islands of the Caribbean were not settled until several thousand years later. There were various odd animals on some of those islands, for example ground sloths the size of a bear. They did not go extinct at the same time as the large animals on the mainland: they waited for people to show up and then kicked the bucket. Which is odd if you think that climate change or an impact caused those mainland extinctions. When humans did arrive, they seem to have started in Trinidad (very close to the South American coast) and moved up the Lesser Antilles. This seems to have happened repeatedly with successive waves of invaders, the last being the Caribs. This suggests that a chain of islands with fairly small separations is a good recipe for developing your maritime capabilities, and maybe that was the case for the road that started with Bali and continued on to Sahul and the Solomon islands, back in the day. Without writing, it probably doesn’t take long at all to lose an entire impressive suite of prehistoric boat-building knowledge. Nonetheless this seems like evidence for a certain lack of thickly populated areas, since under circumstances where there were continuous settlements from west coast to east, we’d expect someone who knew about boats to travel from one coast to the other at least once in a long while. Maybe the early settlers were only comfortable on the coasts for a long time. Prehistoric people didn’t generally travel large distances from home. And someone with boat building or sailing skills would have a strong incentive to stay near the coast. Why would someone with those skills trek over 2000 miles (on foot!) through territories where their skills were useless? Crossing from the west to the east is a journey of a hundred miles at the various narrower parts of Central America. Why would you expect seafaring skills to survive as a population of hunter gatherers expanded across an entire continent? I would expect them to survive if people expanded along the shoreline, down the west coast all the way to South America – at which point someone in the central part would not have to travel all that far overland in order to reach the Atlantic. If the Chinese habit of using leashed otters to herd schools of fish within reach dates back that far, some kind of swimming ferret might have been used in the Caribbean too. Baby Mylodons would be vulnerable to a new kind of rat. Or maybe the leash was on humans with Mylodon masters, until they activated Otternet. Trinidad. It seems that North American Natives didn’t lead in much, until very late in the day with the Mississippian builders. Sounds like it could have been a selective event. I wonder how the Taino/Caribs who ended up in Haiti differed from the ones who stayed in Venezuela. Don’t people of Carribean descent punch above their weight at athletic events? Ground sloth tastes like chicken. Instant chicken, I suppose. What if you don’t grind up the sloth? “a chain of islands with fairly small separations is a good recipe for developing your maritime capabilities”: my dear sir, you should read Irwin’s marvellous book. Just bought it. Looks good. Thanks for the tip. I vote for the name ‘Barbeque People’ for the first Americans. Because it looks like that’s all they did. Kill big game and cook it. No idea if they invented any sauces other than salt. Could anyone survive on a diet of protein and a little fat? I suppose their kin in the Arctic did. Hm, but would the Arctic diet would have had a higher ratio of fat to protein? Actually, we know for a fact that flour made from wild cereals was already in use by the Clovis era. Hunting and gathering isn’t just about big game hunting. Sure, what are the women going to do, spin wool? They need something to do to keep themselves from going bonkers and something for the kids to do.NW Indians had them making baskets and hats and carriers. And digging roots and berries. Did they really need to? No whaling, sealing, and fishing not to mention blind hunting and drives brought in enough food that even shellfish was considered ‘famine’ food by some tribes. Who doesn’t want to eat tasty muscles? Old Makah apparently. They had villages that stretched for a mile or so from the river sources and had thousands. The Camas root was an afterthought and a diversion for the women and kids. Berry picking was still a women and children thing when I was a kid with grandad occasionally helping out. We made jams rather than ‘Indian Ice cream’ with it but the tradition was the same with everyone keeping an eye on the best berry patches as they ripened and some of us making sure we got plenty of our favorites. My great grandmother was the last one that used any camas flour and she mixed it with regular flour to make cookies. I thought they were good when I was little. When I think back maybe they were not quite what my memory painted them to be. People want to eat tasty muscles, but they also like to add carbs and fat. You can look up “rabbit starvation” for a description of the effects of a human diet of only protein. But as some wag noted, in the West we have fries with our burgers, while the Yanamamo complain that meat isn’t as tasty without roasted plantains.